Washington, D.C. is under the exclusive jurisdiction of the United States Congress. As such, it is not a part of any U.S. State. The White House has 132 rooms and 35 bathrooms. Formerly known as the President's Palace, the President's House, and the Executive Mansion, its current name - the White House - was coined by President Theodore Roosevelt in 1901. The area of Washington, D.C. that is known as the National Mall extends from the base of the Capitol to the Potomac River just behind the Lincoln Memorial. That's a distance of about two miles! Nearly 30 percent of Washington, D.C. is national parkland. Every country that maintains diplomatic relations with the United States has an embassy in Washington, D.C. Most of the embassies are found along Massachusetts Avenue (a.k.a. Embassy Row) and other streets in the Dupont Circle neighborhood. Washington, D.C., or Washington, District of Columbia, as it is known in full, was born out of the American Revolution (1775-83). After the United States won its independence from the British, Congress decided that a city should be designed and built to house the new nation's seat of government. The Residence Act was passed on July 9, 1790 and approved the creation of a national capital on the Potomac River. The exact area that was ultimately chosen for the capital city included two pre-existing settlements - Georgetown, Maryland (founded in 1751) and Alexandria, Virginia (founded in 1749). A French-born American engineer by the name of Pierre Charles L'Enfant was appointed by President George Washington to design the original layout and streets of Washington, D.C.. His city plans were ready by June of 1791. Later that year in September, the three commissioners who were overseeing the construction of the nation's capital named the city in honor of President Washington. The affiliated federal district was named Columbia - a poetic name for the United States that was commonly used at the time. On November 17, 1800, Congress held its first session in the new capital city. The rest, you might say, is history. One of the world's most famous buildings, the White House is the oldest federal structure in Washington, D.C.. George Washington selected the site for the landmark edifice in 1791. He also chose the building's designer - an Irish architect named James Hoban. 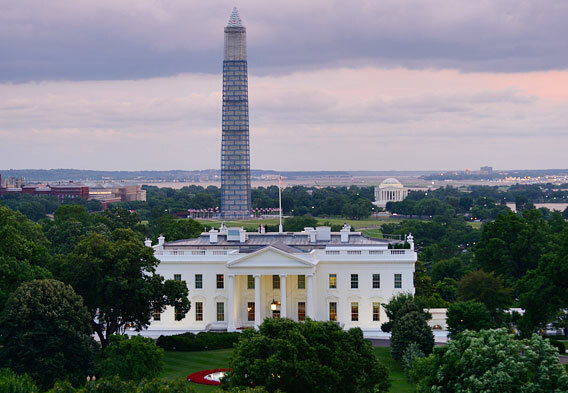 The cornerstone for the White House was laid in 1792. Eight years later, the home was ready for President John Adams and his wife, Abigail. It is interesting to note that during the War of 1812, the British set fire to the White House. Hoban was appointed to rebuild the structure, and over the decades, there have been other expansions and renovations. The White House that you see today, however, remains true to Hoban's original designs. The address for the White House is 1600 Pennsylvania Ave. NW, Washington, D.C.. The landmark structure is easily one of the city's most popular attractions, and quite simply, no trip to Washington, D.C. would be complete without seeing it. You can hope to do more than just observe its exterior, as the White House is the only private residence of a head of state that is open to the public for tours. White House tours are free of charge. For U.S. citizens, public tour requests must be submitted through one's Member of Congress. Foreigners must contact their embassy in Washington, D.C. for assistance in submitting a tour request. Note: On March 9, 2013, the public White House tours were ended until further notice due to sequestration. When and if they will be reinstated is unknown. Washington, D.C. is awash in museums. Many of these cultural institutions are maintained by the Smithsonian Institution as official museums and galleries of the nation. 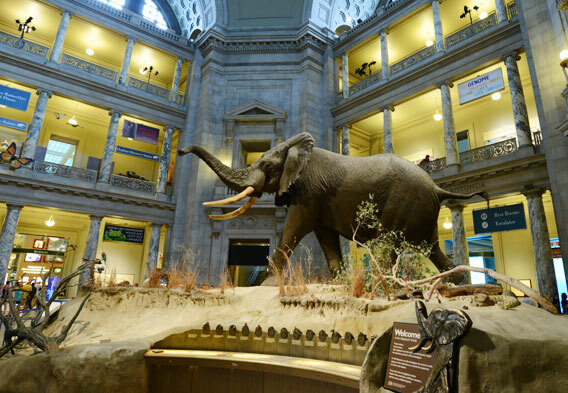 Among the most highly visited Smithsonian museums in Washington, D.C. is the National Museum of Natural History (pictured), which can be found on the National Mall. Numerous other Smithsonian museums can also be found on the National Mall, as is the case with the institution's headquarters -- the Smithsonian Institution Building. Regardless of their exact locations, all of the Smithsonian museums and galleries are free to the public. Complementing the Smithsonian museums are a multitude of private Washington, D.C. museums. Notable examples include, but certainly aren't limited to, the National Gallery of Art, the Corcoran Gallery of Art, The Phillips Collection, and the National Geographic Society Museum. Memorials figure among the main Washington, D.C. attractions. 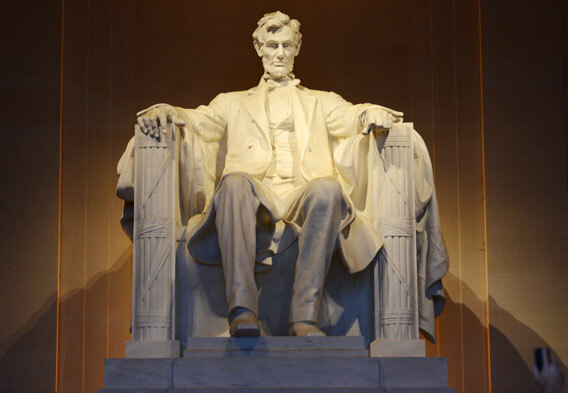 The most famous include the likes of the Washington Monument, the Jefferson Memorial, and the Lincoln Memorial (pictured). This is just the tip of the iceberg, however. Other notable Washington, D.C. memorials include the George Mason Memorial, the District of Columbia War Memorial, the National World War II Memorial, the Franklin Delano Roosevelt Memorial, the Korean War Veterans Memorial, the Martin Luther King, Jr. Memorial, and the Vietnam Veterans Memorial. The majority of the Washington, D.C. memorials are found in the area that the National Park Service calls the National Mall and Memorial Parks. As the name implies, this area includes the National Mall. 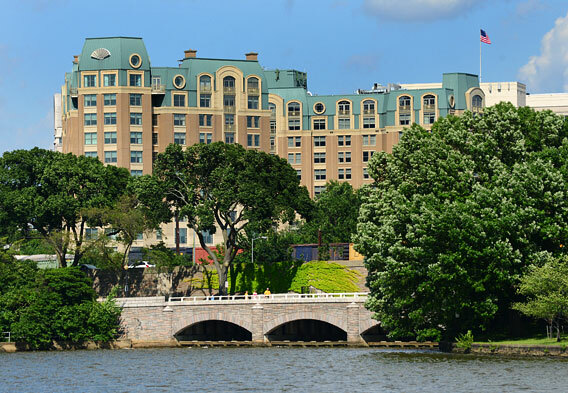 Washington D.C. and the surrounding area are home to hotels of all kinds. This is good news for visitors who like variety or have a specific lodging budget. For those visitors who aren't overly concerned about lodging rates, there are some wonderful Washington DC luxury hotels to select from. Two of the best call the historic Georgetown neighborhood home. They are the Ritz-Carlton, Washington D.C. and the Four Seasons Hotel Washington, DC. In the Capitol Hill/The Mall area, the Mandarin Oriental (pictured), Washington, D.C. awaits, and the highly alluring Penn Quarter district is home to the Monaco Washington DC, a Kimpton Hotel. Thanks in part to The Jefferson, the Dupont Circle area is also a good place to focus on when looking for luxurious Washington, D.C. hotels, and midtown is where you will find the alluring Hay-Adams Hotel. The list of DC luxury hotels goes on, so discerning travelers should have little trouble finding their ideal lodging fit in the nation's capital.